Filters for your MINI Cooper. WMW carries all the filters you need for your MINI. We have Engine Air filters from Alta, K&N, Cravenspeed, Afe, and UNI filter. Original Equipment MINI OEM oil filters. 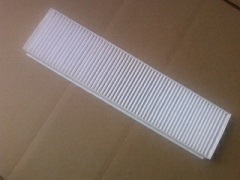 OEM micro filters for the A/C system that are charcoal filled, or just paper. We also have cleaning kits for after market K&N cotton filters and High flow foam filters. Then we have other filter related items like engine oil drain plugs, oil filter sockets, and fuel filters.